Toto’s Tale for Oz fans – It's about time! I wrote Toto’s Tale with children ages seven to twelve in mind. But recently a couple of people have said they were interested in the book because they’ve been life long lovers of the Oz books and have collected them. Or someone was buying the book as a gift for an elder who loved the Oz books. 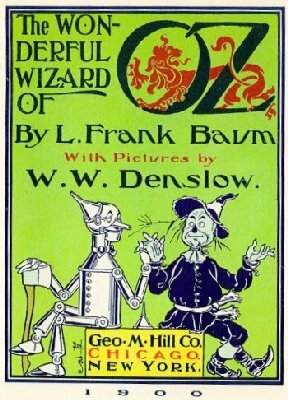 The Wonderful Wizard of Oz by L. Frank Baum was published in 1900 and has been beloved by several generations of readers. The charming illustrations were created by W.W. Denslow. Since they are no longer copyrighted, I’ve used a few in my book. And the print is large, for the benefit of young readers, but also easier for older eyes. So, my point is, as I watch an Anna’s Hummingbird and then a flock of Bushtits perch on the acacia outside my window, my point is, older Oz fans, as well as dog lovers, may want to consider reading Toto’s Tale and True Chronicle of Oz. You can find it in Bookshop Santa Cruz, on Amazon, and as an e-book on Smashwords and Barnes and Noble. And you can check it out from the Santa Cruz Public Library.